As my parents and their friends are in town for the week, we have been out and about hitting the town. I usually would not venture to Midtown for dinner, but they were all very excited to try one of the Nobu restaurants, Nobu57. 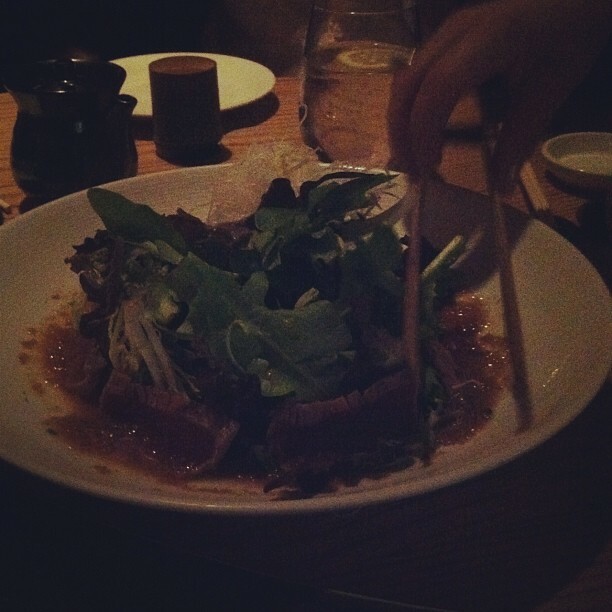 The last time I went to Nobu was several years ago in the Bahamas so I was eager to try it again. The chef recommends that the dishes be shared family style. You start with some cold dishes, move on to hot dishes, round off the meal with some sushi and rolls, then on to desert. Our first dish was a cold one, a salad with tuna on the sides (as seen above). 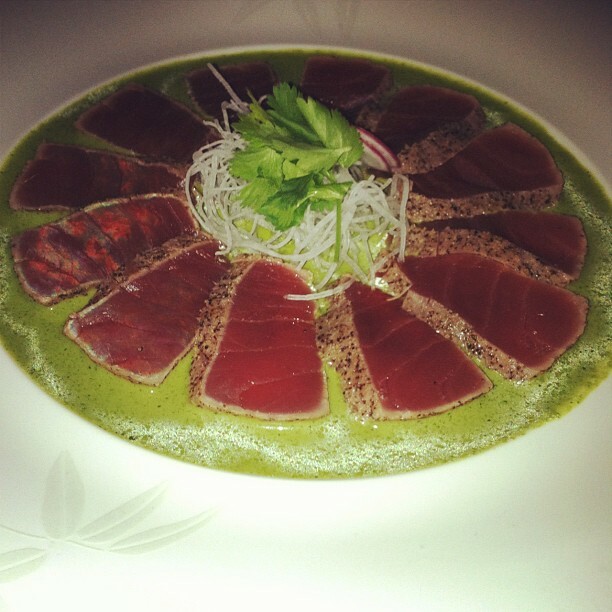 It was a great, the tuna tasted almost like a good steak. On to the next cold dish. More tuna! Adding the cilantro on top really added to the flavor. Delicious, fresh fish with a great sauce. The next cold dish was a white fish with super super spicy power on top. It was too spicy for my taste, but again adding cilantro helped tone that spice down. 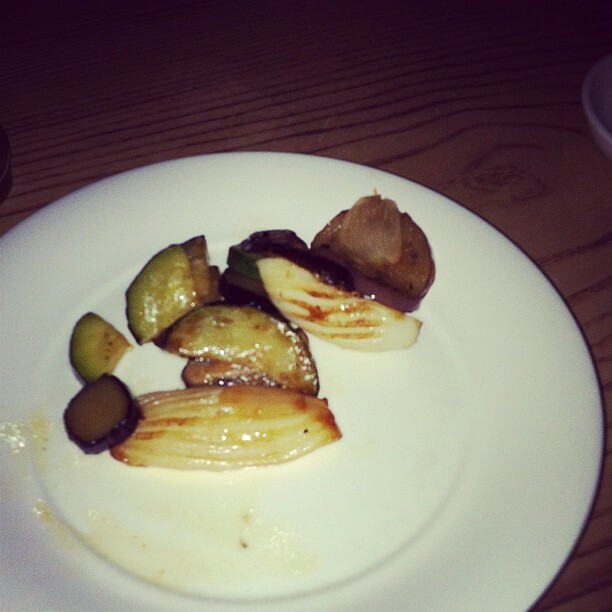 Moving forward to the hot dishes. 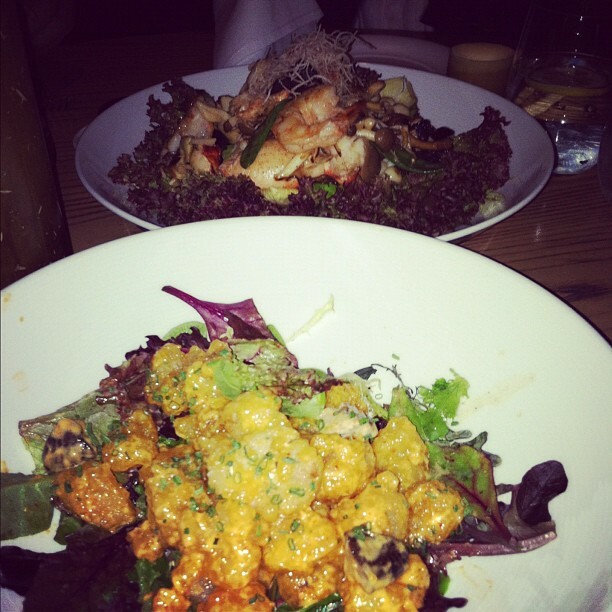 The dish in the background was a special gift from the chef: mixed seafood salad. There was shrimp and lobster in the mix. But my absolute favorite is the rock shrimp in the foreground of the picture. It is perfectly fried chunks of rock shrimp topped with a spicy cream sauce. I had it several years ago and was so excited to try it again. Great crunch, not too spicy. Our next hot dish was squid “pasta” with garlic sauce. That’s right, those pieces that look like pasta are actually squid cut and seared to look like cooked pasta. Along with mixed vegetables, these were tossed in a light garlic sauce. This dish really represents how successful fusion food can be. Our final hot dish was actually not seafood. We rounded off the meal with the Beef Toban Naki. 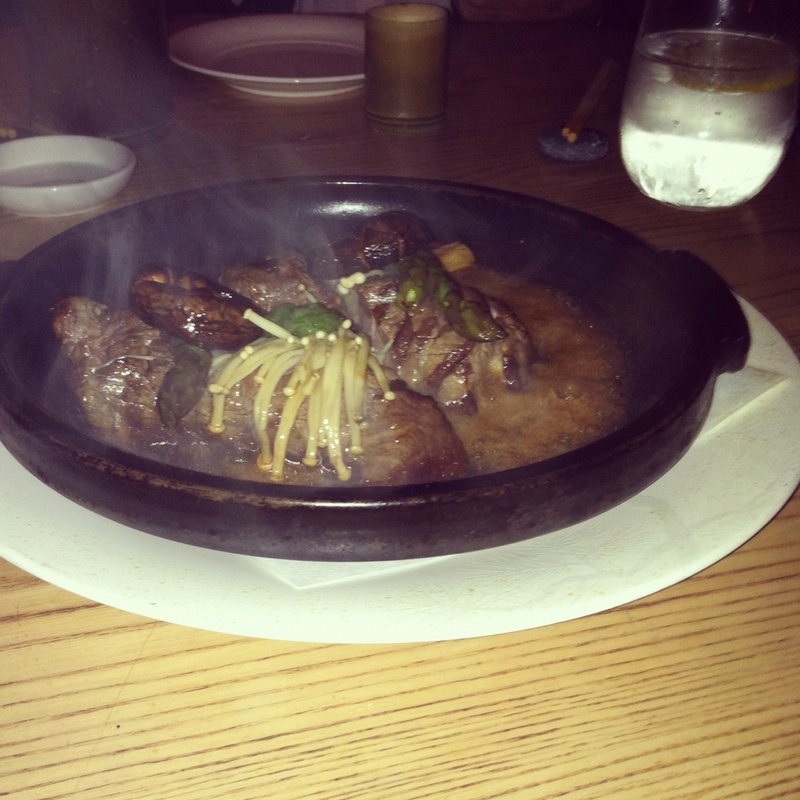 It arrived at our table still sizzling and cooking from the open kitchen. The steak was warm and flavorful. 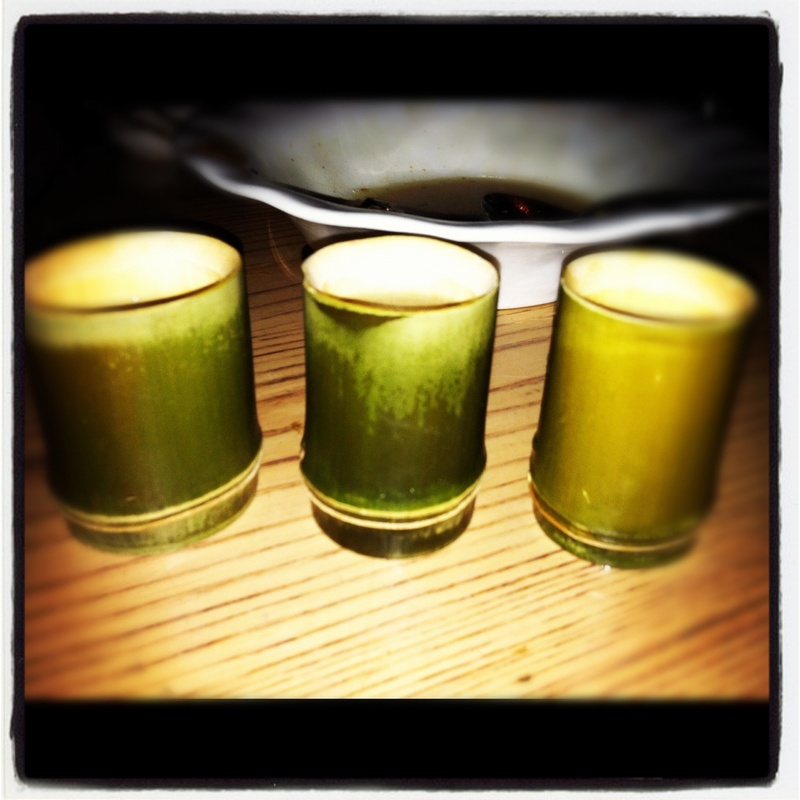 Our sake came in bamboo shaped glasses. About half way through the meal, we realized that the men and women had different sized glasses. The probably held the same amount of liquid (hopefully). 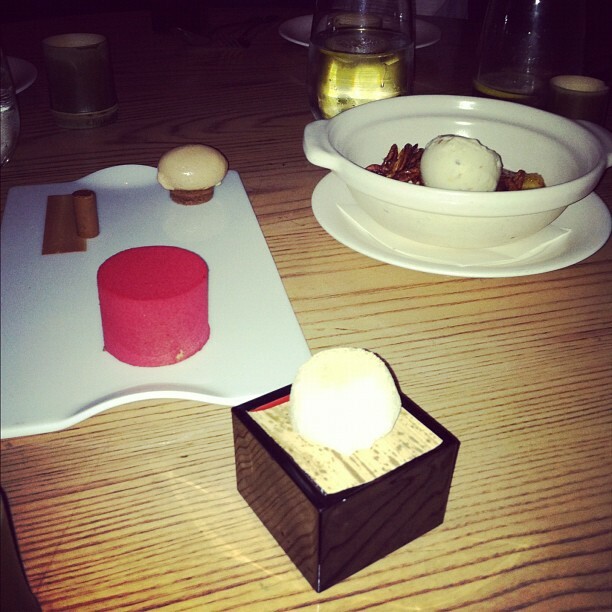 After all of those great hot and cold dishes, we decided to skip the sushi and move straight to the desert course. We had three varieties of desert. The first was an individual scoop of freshly made mochi ice cream. The three different shapes on the flat plate are actually a chocolate cake with Milk chocolate cremoso, yuzu sponge, caramel mousse, praline crunch, hazelnut gelato. To eat it, you take a tad from each onto your spoon and eat the three bites together. The final dish was the Banana Soy Toban Yaki with Shoyu caramelized bananas, roasted pecans, and Malaga gelato. All three were a very interesting experience to say the least. I would have to say I enjoyed Banana Soy Toban Yaki the most. In case you were wondering how the mochi stayed cold, it was resting on a bed of ice in its little box. 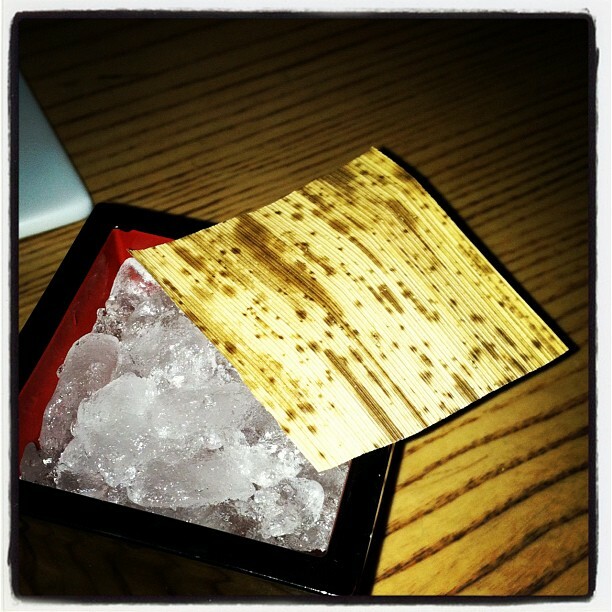 Overall, Nobu57 was an excellent dining experience. The prices were not cheap, but for a special celebration, this would be the place to come. The decor was beautiful, and even though the room was packed, it was not too noisy. Our waiter was both knowledgeable and friendly. He was so attentive, I felt as if we were his only table in the room. Not only was the food excellent, but it was light. After so many courses, you think we would feel stuffed, but no one felt sick. 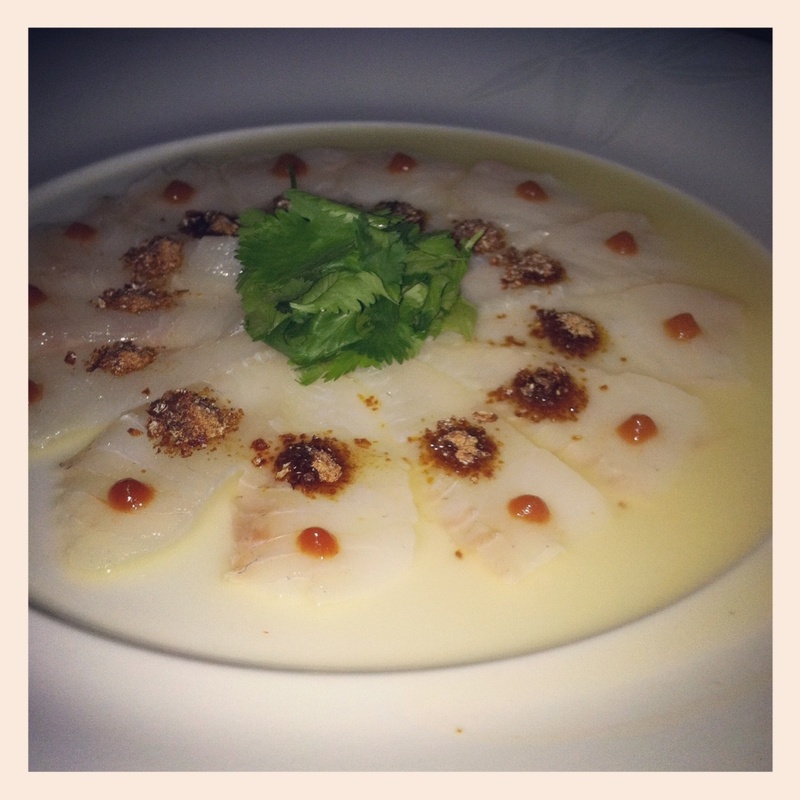 I would highly recommend Nobu57 if you are looking for a night out on the town.